We would like to take this time to congratulate Jason Jones, from Howards Peugeot/Hyundai Yeovil for completing a 310 mile bike ride in aid of Macmillan Cancer Support. The Ride24 event started in Newcastle at 11am on Saturday 22nd and finished on Sunday the 23rd of August, in London. Around 400 people took part in the event, with the aim of completing the challenge within 24 hours, arriving at the finish line in Smithfield Market, London. The scenic route took the cyclists through Tyne and past the Angel of the North, which carried along into the windy Yorkshire Hills, through York and then onto Humber and the flat Lincolnshire countryside. After passing through remote villages and quiet English countryside, the cyclists eventually reached the capitals skyline where the finish line awaited them. After cycling all day and night, Jason made it to the finish line at 9:37am on the Sunday with a final time of 22 hours and 37 minutes. 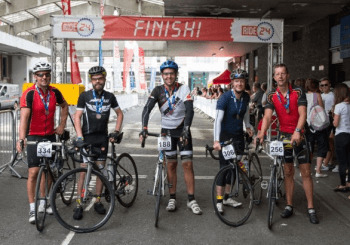 Only 132 of the cyclists completed the challenge in the 24 hour time period, and even though it wasn’t a race Jason was extremely proud to finish in 60th position. So far, Jason has managed to raise an impressive £1031 in aid of Macmillan Cancer Support and we would like to say a huge thank you to everyone who has supported him. To make a donation, you can do so through Jason’s Just Giving page here.